Learn how to properly maintain the outhouse at your cabin. We cover how to treat the waste in an outhouse in an environmentally sound procedure. A: An outhouse is one of the simplest tools for answering nature’s call. But keeping an efficient and environmentally friendly outhouse requires some maintenance and a touch of thoughtful planning. 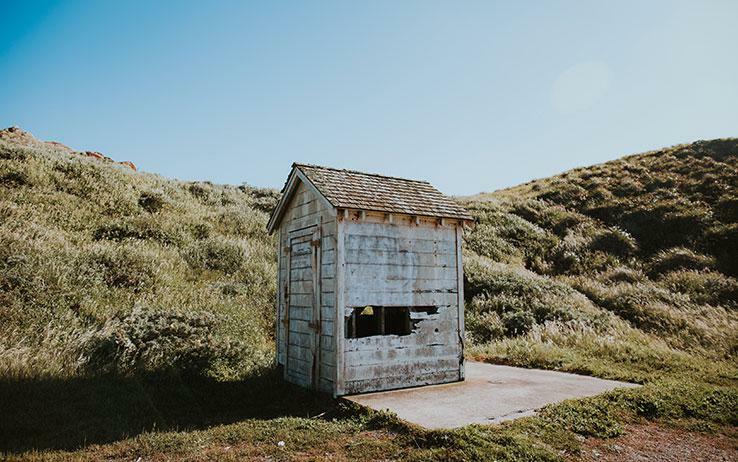 According to Max Burns in his book Cottage Water Systems, the two most common types of outhouses are the vault privy, which houses waste in a holding tank below the outhouse, and the pit privy, which is simply a little house built over a hole in the ground. Vault privies, because they keep waste from leaching into the ground, are a lighter load on the land environmentally and less of a danger to the groundwater. Vault privies need to be pumped out when the holding tanks fill. Since your outhouse has seen the passage of so many moons, it seems you have found yourselves the proud owners of an old-fashioned pit privy. Limiting what goes into the hole is the first directive in good outhouse-keeping. Human waste and toilet paper are the only things that should be sent down to the pit. This means no vegetable cuttings, no diapers, no baby wipes and no gray water from kitchen sinks and washbasins. For controlling odors, Burns suggests running a 3- or 4-inch plastic pipe from just under the bench of the outhouse to about two feet above the roof to let out the pit gases. Next to that, install a 11/2- to 2-inch pipe to let in fresh air. Both pipes should be screened at the top to keep insects out. A type of lime called calcium hydroxide, available at feed stores, can be dropped down the hole to reduce odor. But lime might halt decomposition. Ash from a wood-burning stove is better for decomposition, but less effective on odors. In either case, a surgical mask or bandana can protect you from the dust cloud that is sure to come back at you. Bacteria, evaporation and seepage all combine to reduce the amount of waste in the hole, but not necessarily as fast as the pile of waste accumulates. When the pit is full, it’s time to dig a new hole – and move the outhouse. A backhoe would come in handy.